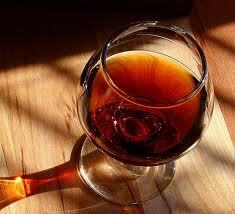 Port wine is typically richer, sweeter, heavier, and possesses a higher alcohol content than unfortified wines. This is caused by the addition of distilled grape spirits (aguardente similar to brandy) to fortify the wine and halt fermentation before all the sugar is converted to alcohol and results in a wine that is usually either 18 to 20% alcohol. Tawny ports are wines, made from red grapes, that are aged in wooden barrels, exposing them to gradual oxidation and evaporation. As a result, they gradually mellow to a golden-brown colour. The exposure to oxygen imparts “nutty” flavors to the wine, which is blended to match the house style. Ruby port is the cheapest and most extensively produced type of port. After fermentation, it is stored in tanks made of concrete or stainless steel to prevent oxidative aging and preserve its rich claret color. The wine is usually blended to match the style of the brand to which it is to be sold. The wine is fined and cold filtered before bottling and does not generally improve with age. Port is produced by over 200 California wineries including Andretti in Napa, Eos Estate in Paso Robles, and one of our favorites, Sunstone in Santa Ynez.